M-Boss Inc. 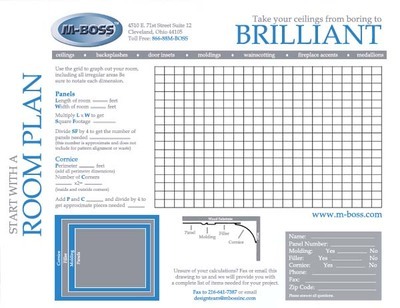 Installation - M-Boss Inc.
​Plan your project with our Room Planner PDF! Our DIY-friendly instructions will have you installing like the pros in no time! Please be certain of the order at the time of placement, as colors/finishes can vary between orders due to subtleties in the manufacturing process. All M-Boss Inc. products are made to order, and therefore, have a lead time of 10-20 business days. Custom and replicated products will have an individual lead time quoted prior to ordering. Any order may be cancelled within 24 hours of ordering. No cancellations will be accepted on any product after 24 hours. Inspect all items upon receipt for damage and quantity verification; discrepancies must be reported within 7 days of receipt, to be evaluated by Quality Control. NO returns on discrepancies will be accepted after 7 days. A return-authorization number from the factory is required and product must be shipped back within 3 days of obtaining this number. All shipments are F.O.B. our dock. For prices, products, specifications, and offers, M-Boss Inc. reserves the right to make adjustments/improvements due to market conditions and availability.